Your trip to the Mediterranean promises to be the experience of a lifetime: Renaissance art, ancient ruins, medieval architecture, spectacular vistas, and more. But have you factored a visit to the market into your travel equation? There is no better way to get a sense of the local food, artisan products, and even the rainbow of colors unique to a region than to visit a market. With no obligations and no entrance fees, you can take in as much or as little as you want at a market—but do take in one or two as you venture on your Mediterranean journey! Know that the time of day you get to the market can really make a difference in your experience. Here’s where being an early riser is a competitive advantage. Generally speaking, the earlier you can get to the market, the better chance you have of enjoying all it has to offer (and the less chance you have getting jostled among fellow tourists like a pinball). Also, keep in mind that many open-air produce markets close down soon after lunchtime. Some of the best markets are quite large—you would do well to research and come up with a plan of what specifically you would like to see, buy, and taste. Expect large crowds at major attractions like Mercat de la Boqueria in Barcelona and stay aware of your surroundings so as not to be a target for pickpockets. If you are simply considerate of others, you will fall within the acceptable range of good behavior at a market. But there are some unwritten rules. When you take photos, for example, make sure that the people in the picture consent to be in them, and take care not to get in the way of the vendor’s business. Don’t rearrange the produce because touching the merchandise is big no-no. It is basic good manners to begin conversations with the appropriate greeting in the lingua franca, for example, “Bonjour, Monsieur.” Make sure that you only begin the conversation about price if you are interested in buying; that is, don’t start a conversation about purchasing something just for entertainment. Smart market shoppers also bring cash. Why? Simply put, vendors make more money when you pay cash. Some vendors don’t take credit cards, and it’s always a good idea not to hold up business with a pen-and-paper transaction. Cash is common sense. It’s also a bargaining chip when it comes to haggling. About haggling: in markets in the Mediterranean, and indeed, around the world, there is tradition of bargaining down the “original” price of non-food items. If you’re North American, vendors assume you are wealthy, and they are not shy about taking advantage of this fact. Rick Steve’s article on the topic of practical haggling is a wonderful reference. 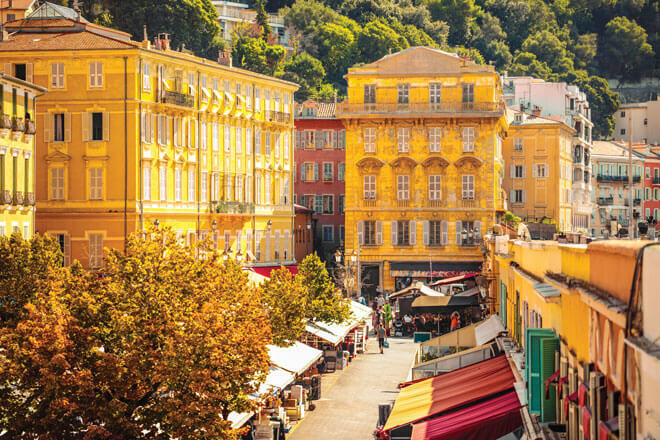 Flower Market: Go to see the glorious explosion of color that inspired all of France and beyond to import Nice’s blooms. As in many markets in the south of France, lavender perfumes the air here when it is in season. Fruit and Vegetable Market: Try some socca, the savory chickpea pancake that is a Niçois specialty and look for vendors offering tapenade—pickled vegetables of various recipes—to take home. Antiques/Flea Market: Because you never know what you will find! Furniture, knick-knacks, and curios are for sale on Mondays. Evening Arts & Crafts Market: Features paintings, jewelry, and other artisan treasures. In Florence the essential market experience is the combined Mercato Centrale, an indoor food venue, and the outdoor San Lorenzo market that bustles in the streets surrounding it. Inside the Mercato Centrale, you can shop the food market on the first floor and also visit the gourmet food court upstairs. Choose to order from the stalls set up for specific types of Italian specialties or simply watch the artisans craft their gelato, cheese, pastries, and other regional foods. As for the open-air San Lorenzo market in the streets below, make sure to stretch those bargaining muscles before you head out, because you’re going to need them. It’s a busy, touristy mélange of paper goods, pottery, clothing, and various knick-knacks. Florence is known for its leather goods and there is a wide variety here. Mercato Trionfale is the largest covered market in Rome and is not far from the Vatican, so it’s an easy-access destination. Be aware that this market caters to locals—an authentic Roman experience is the goal when you visit here. Stop by before or after sightseeing to sample porchetta (roast pork) or pizza. For the foodie crowd, Mercato Testaccio is the destination of choice for Italian street food. Visit the enclosed, airy venue with seating available to sample excellent Italian food and wine in its stalls. Look for panini and handmade pastas. Or order a coffee as a pick-me-up, but make sure you know how to order coffee like the Italians do! The restaurant counters here are destinations in themselves. Skip breakfast so that you can sample local specialties here and, no matter what time of day, enjoy a glass of cava, a sparkling wine from Catalonia. Find good prices on Spanish smoked paprika for your paella experiments. Ham is important in Spanish cuisine. Sample a few grams of the pricey jamón ibérico in a cone to get a taste of this world-renowned delicacy. There is a market for all tastes, all pocketbooks, and all seasons on the Mediterranean. Do not hesitate to immerse yourself in the panoply of color, scent, and sound—and bring something back to remember your adventure!